The Acerbis X-Factory Handguards feature a steel bar wrapped with an injection molded Nylon composite. A replaceable dual injected polypropylene shield, mounts to the bar offering un-surmounted protection from roost, debris, and extreme conditions. Comes with both left and right handguard and universal mount kit. Designed to work with either 7/8", 1 1/8" or twin wall handlebars. 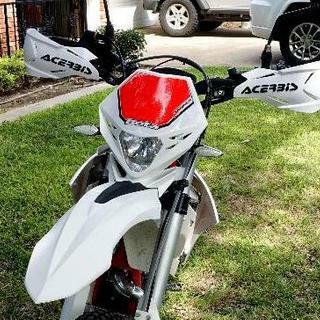 These will work on ATV's but you must purchase the Acerbis ATV Handguard Adaptor sold separately part #109589. 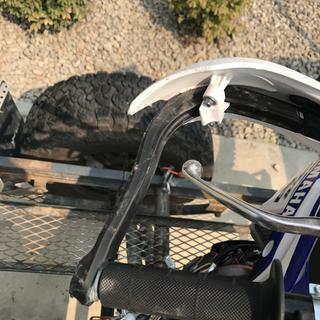 Hand guards are made of good quality. Haven't had any good crashes yet. Instructions are poor but install like all other hand guards. Just pay attention to what direction the spacers go on the handlebars. I love these hand brace/guards. I’ve taken a couple spills in my day and these have saved my bike. Never a broken lever or dented pipe with these. Installed fairly easy. They feel solid and like they will protect my hands. Plus they look great on my bike!!!! Easy to install. Fits well, looks great & preforms well. After a few field tests ;) I can confidently say they WORK! Fit perfect and looks even better than it fits. I love all the color combos to choose from. Have only had one ride with them, but so far so good. Prefect fit. Durable. Easy to install. They will not work with flex bars. I've had these on for a few months now. To start off, they're super easy to install and seem sturdy once mounted. They look great and the coverage area is great. I really liked them on my first few rides because nothing touches your hands. A few days ago, I had my first real fall with them, and was quite disappointed to find the bar severely bent. So much so, that it trashed my clutch lever, and thus far, I've been unsuccessful in getting the hand guard bent back to bolt up properly. No, it looks like I'll have to buy new guards, along with a clutch lever, from a pretty soft fall. I really expected more durability from them. Big fan, put them on all my bikes. I like these and the Cycra's. Bought for my Beta, Should have just bought the cyra pro bends in the first place. Nothing really wrong with them, but take lot of fiddling around to get them to fit solid. You really get what you pay for and these are on the cheaper end of hand guards. First race and my daughter broke both bar insert bolts and bent the steel bars. I think the aluminum ones are stronger. I have straightened them out and purchased the kit to thread the end of the bars to eliminate the wedge still but have not received them yet. Hoping that will strengthen them a bit. Good coverage and installation, but one of the bar bolts shook loose first ride. Look good, I wish they had more of a sweep like the other ones where the hands and levers pull in for more room. Shouldn't be a problem for short shifters, but I did have to position these a bit to make sure my clutch level wasn't hitting since it's real tight. 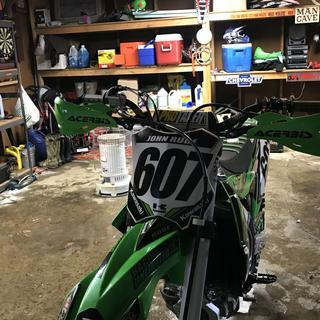 One of the bar bolts shook loose and came off during a ride, when I went to get another bolt, I couldn't fine them, only the larger diameter ones for other hand guards. An email to the acerbids customer support from their website hooked me up though so awesome on their part. Easy to install. Looks great. Shields aren’t very strong though. Super easy install and very slick looking. Make sure you have a hack saw. 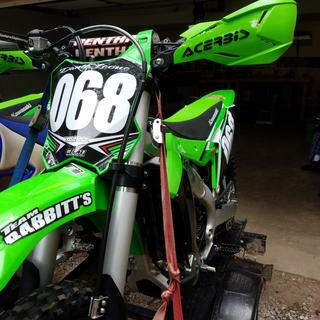 These hand guards are amazing. We have used another brand for years. I purchased these after seeing them on another bike. These are solid hand guards. 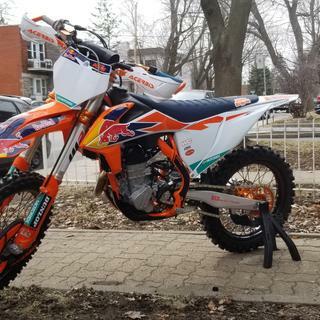 Great product and the fit the 18 ktm 85 great! Looks good and do the job! These bark busters look good and do the job. They are a must have for riders that like the woods, especially any single track. Don't have to worry about trees and limbs and they're stylish too! 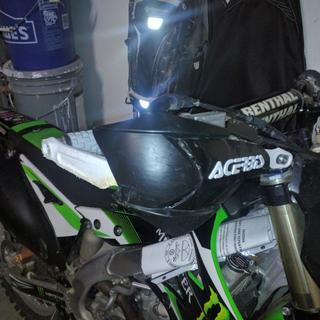 These Acerbis hand guards with bark busters are very practical to install, look great!! Seem to be very good quality, look nice, hold up well to trees. Install was easy and simple. Would be nice if they included some loctite to make sure fastener bolts don’t come loose. Way better design than the older versions. Still could use better bar mounts! I used the bar mounts from a Cheap Tusk kit and they fit perfect! 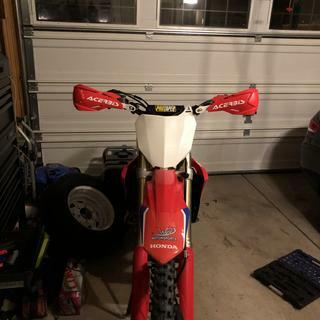 I’ve always been a fan of the Rally hand guards, so I thought I’d give these a try on my 2017 CRF450RX. They look fantastic with the newer styling and still offer all of the great protection. Installation was straightforward and easy, and comes with everything needed for regular or tapered bars. Another awesome Acerbis product! 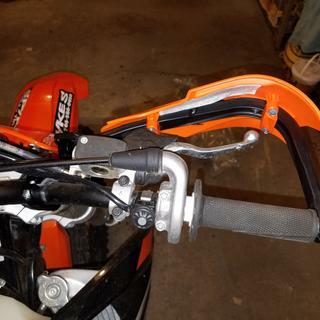 Rugged hand guards that look great! The hand guards are very stylish and hold up well during impact. When using the inserts make sure you tighten them as tight as possible. 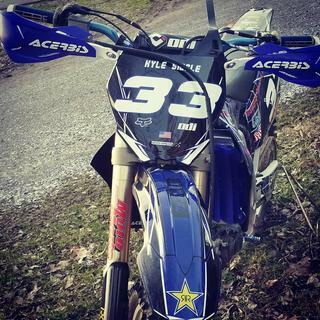 They are positioned at a slight angle on the YZ85 because of the mini bend bars. 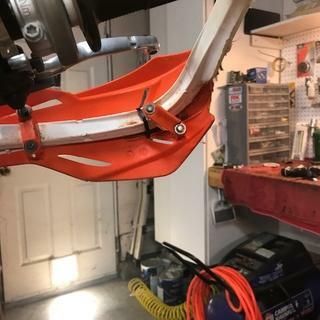 these are terrible save your money, buy the cyrca probend I put these on my daughters 2017 KTM XC-W and both of the shield pieces broke on the first fall, they are a poor design, I have had pro bends on my race bike for 2 years and they are still in good shape. I threw these away and bought probend don't waste your money. I was not aware that these were universal when purchasing, but was able to get them installed. The inside clamps were really hard to get set due to the universal fittings, but I was able to make it work. They looks great and have stood up to numerous hits, crashes, and thuds and keeps asking for more. 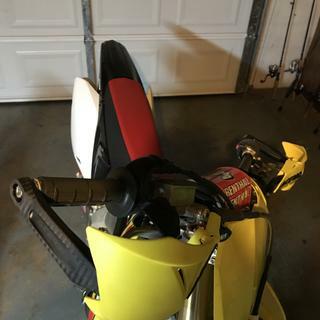 Dropped the bike and the hand guards saved my levers. Also saved my hands a couple times from trees. I think they look pretty cool too. Nice product, 15 min to install no drilling, came with spacers for straight bars and tapers. fit perfect, clears all lines, and line up with center of levers, look pretty sick too. 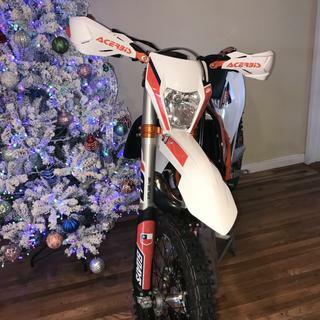 Bought for my KTM 300 xc. They provide plenty of room around levers and look great on the bike. Not 5 stars due to one of the clamps for the bar mounts was machined too wide. This was probably an uncommon production defect. I was able to grind some of the metal away and make it fit. Still looks great! These things are awesome. They seem to be very strong and durable so far. Very easy to mount. They also look really good too. Great guards, get you some! Quick and easy install. Instructions were a little packing but it's pretty straight forward. Great quality, highly recommend. Been through a few different brands over the years and these are my favorite. I love these guards! They are by far the most attractive handguards available today, that still provide superior hand coverage. 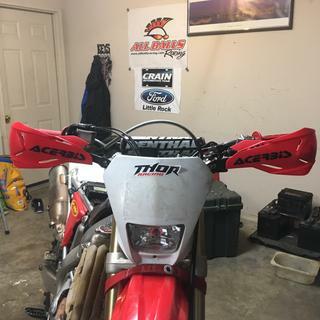 I've had them installed for a couple months now, and raced in several hare scrambles. They've taken some significant impacts and held up well. My last race, I did manage to break a mounting tab on one of the shields. My only complaint about them, is the replacement shields are not currently available through RM, but they are available from other distributors for around $20. 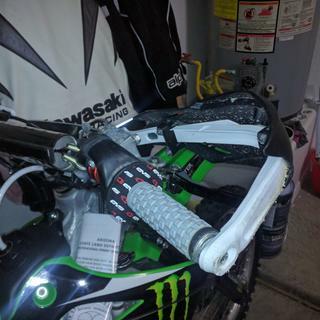 Do Not buy these hand guards if you plan on needed them. 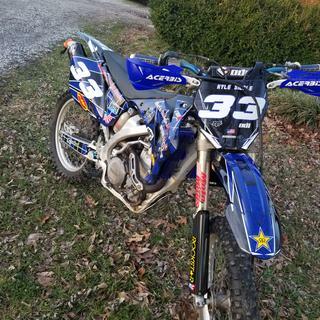 I've been riding/racing for over 20 years and have always run full hand guards. These acerbis guards look awesome and are great as long as you don't plan on using them.... These have to be the weakest guards in the planet. If you look at them wrong they will bend. I've never seen anything like it. I purchased 2 sets, one for me and one for my girlfriend. She is still learning so she tips over fairly often. After 3 rides her guards were so bent she couldn't use her levers. The Tusk ones on her previous bike didn't even bend like this! I bent one of mine after a small impact with a small tree on a tight tree (not even hard enough to cause me to fall) and the other bent the first time I slowly laid my bike down on a rocky hill. I'm truly disappointed to see a product like this from a company with such an extensive background in enduro. I will be going back to either Cycra or Enduro Engineering. Love the look of these guards on the bike. Installation instructions are lack luster, but anyone working on a Dirt Bike should figure it out. Great looking product seems as they are pretty good quality although when installing, you could easily strip brackets if you tried to tighten too fast and not evenly but I had no issues and it went quick. easy ordering process From a good company. These things are sweet. Out here in Arizona most branches and such have thorns on them, now I don't have to worry about them. Also I don't have to worry about broken levers our torn up grips if I drop my bike. Love them. Such a life saver or should I say hand saver. One ride in the woods and you got your money's worth! Really like these. Look great. Bought them after a friend bought them. That friend immediate tested them by wiping out when he stoppied with them. They held up great so I was sold! I'm very happy with these but was a little upset by the lack of instructions. Pretty straight forward but still would be nice if they could throw something in there. Only reason it's not 5 star. These were a functional buy. But to be honest this specific one was a cosmetic one. I love how they look. They are deep enough i havent and dont forsee catching my fingers in them. Another great product from Acerbis!! 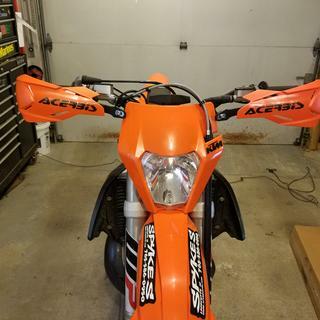 These replaced my factory KTM guards. Great look with good protection. Fairly easy to mount. 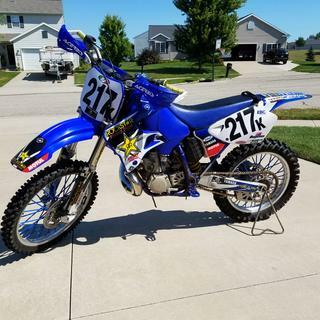 anyone have a pic of their bike with these handguards installed? , cant find 1 picture of them on a bike its really annoying. 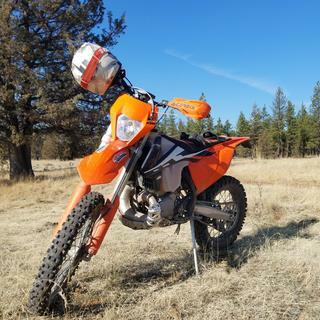 BEST ANSWER: I have them on my 17 ktm 300! They look and work perfect! I can't figure out how to post a picture here or I would. 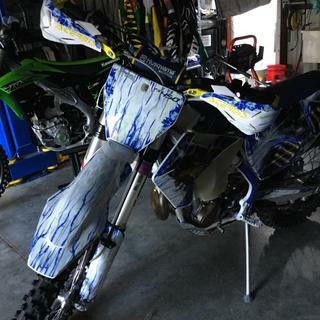 If you need some wrap around handguards, just buy them! You won't be disappointed! 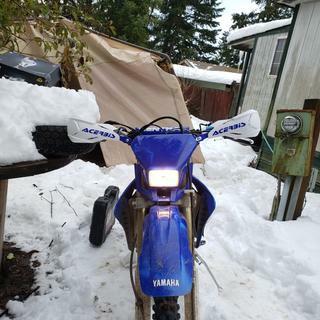 On your 300, what did you do with the extended bolt that the stock handguards and levers mount to? Did you reuse the same bolt or is there a replacement I need to buy somewhere? 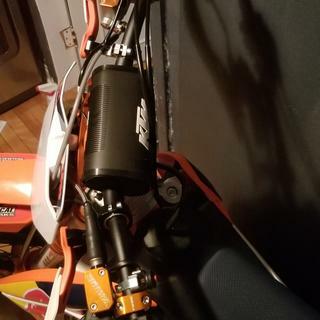 I HAVE INSTALLED SOME ON MY 2017 KTM EXC500, THEY FIT WELL, EVEN WITH ALL THE CONTROLS, I CANT FIGURE OUT HOW TO ADD A PHOTO EITHER....? I just reviewed these and included pics. Hopefully they post them up, keep an eye out for my pics. Hi will they fit a polaris 570 atv? They will fit if you add the ATV extension. Will these work with Flex Bars? If so do you need a specific bar mount? BEST ANSWER: No, you would need to contact them. They make a specific bracket for them. does this come with all hardware? does this come with every thing you need to mount them? BEST ANSWER: Yes they do. 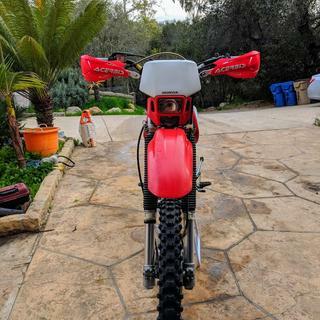 These are great hand guards for trail riding but if you are looking at these for any type of motocross, they just aren’t strong enough. 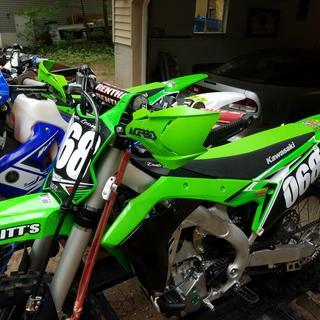 I put them on bike for motocross and after three light crashes they were trashed. Yes, the hardware is included, you don't need to buy another kit to mount them. There is more than one way they can be mounted too, so you can choose what fits best with your levers, number plate etc. Yes. Only thing you will need is Allen wrenches and a razor blade to modify your grips. The kit comes with various insert to ensure a tight mount onto your handlebars. Yes. Everything needed is included. These are excellent guards, very tough, and I highly recommend them. Even my buddies that use other Acerbis guards are jealous. 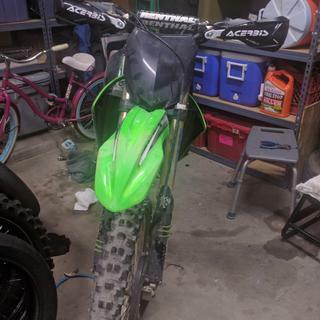 I put them on my 2016 kx450 and had everything I needed. I did order the wrong ones first though. Make sure you get your bar size right. Yes it does, for both regular and fat bar. 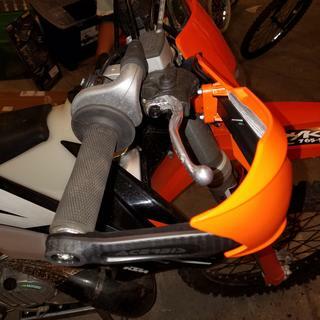 I have the stock handle bars on my 2013 ktm 250 sx-f and it fit perfect! yes, this comes with the bolts and clamps. It also comes with clamps spacers to accommodate most bars. Yes it does. Comes with everything needed to mount on the bike. Yes, they come with everything you need. Yes, all the components are included. Yes it does. Very nice handgaurd. 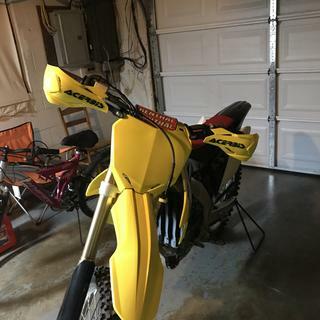 Does it come with two handguards? BEST ANSWER: Yes. It comes with both left and right handguards as well as mounts/hardware for both 7/8 and 1-1/8 bars. Yes, one left and one right. 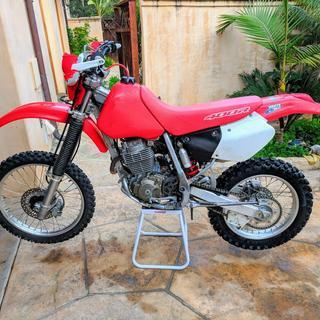 Will these fit on my trx450r? We installed a set on my sons motorcycle. The handlebars have a pro taper design and are different diameters across the handlebar. They fit great and take a lot of abuse. The sales reps at Rocky Mountain are very knowledgeable so don't be afraid to call them and ask questions. 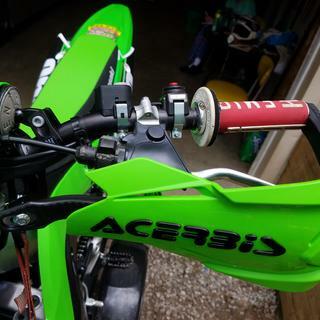 The Acerbis X-Factory Handguards are universal fit and should work on your TRX450R. Go ahead and get them, they are real nice. Rocky Mountain has a great return policy if you don't like them, but I'm sure you will! These are pretty universal. They should work on your trx450r with no problem. BEST ANSWER: YES, IT COMES WITH BOTH SIDES OF HAND-GUARDS, IN A COMPLETE KIT, WITH EVERYTHING NEEDED TO INSTALL. Yeah, I got a set of these, so you get a left and a right. Yes, it comes with everything needed to mount them on the bike. The fitment is fantastic and easy to do in a short amount of time. Yes, I received two hand guards. A left and right side yes. Will they fit Renthal Twinwalls? Yes they come with a universal bar mount that works with all bars. 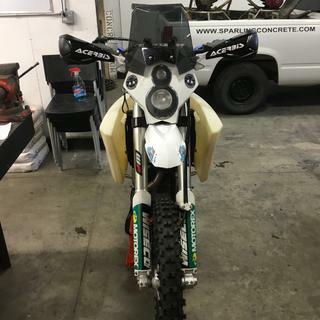 Will these hand guards fit bars that are 1 1/8? Yes. Comes with hardware for 7/8 or 1-1/& bars. Yes. They come with a kit that fits a few. Will the mount kit fit 7/8 bars? BEST ANSWER: Yes they should mount no problem. The kit also provides inserts in order to get a better fit. I believe they come with bar reducers. They fit on my stock bars so yes. 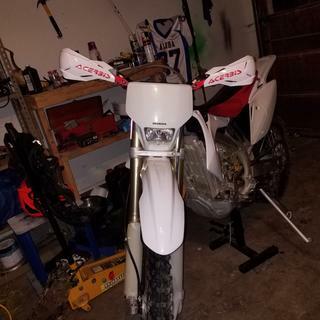 Will they fit on a crf150r whit pro taper low bars? BEST ANSWER: Yes they should fit on pro tapers and they come with a lot of angled pieces that fit inside the clamps to accommodate different bends. 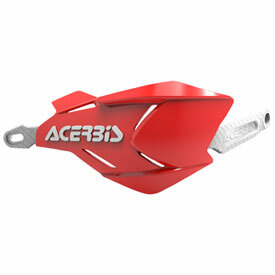 The Acerbis X-Factory Handgaurds should fit your CRF250. Where can I find the replacement guards? The brackets are fine but I broke the actual plastic guard and can’t find them. I got my replacements from Chaparral Racing. I tried to get them from RMATV, but they were not available. Rocky Mtn does not sell them separately without the mount kit. BEST ANSWER: Yes, we do. will these fit 1/8 kx high bars? BEST ANSWER: Yes, these will work with the 1 1/8" KX High Bars. Are these full wrap around? Is the wrap around aluminum or plastic? BEST ANSWER: The bars on these are steel. The steel is coated in plastic or maybe nylon. The hand shields are plastic. THese guards have spacers to fit 7/8 inch or1 1/8 fat bars. I like them fine someone said they are weak, not my experience. I dropped my 400lb Husky terra twice, they did not bend. I believe they were referring to the all plastic flag style shield. J Mo. edgewater fla. It has metal under the plastic coating. My kid has dumped his bike dozens of time and they have not broke. Then have been bent, but we have been able to take them off and bend them back in shape. the wrap around bar is aluminum. I've had these for 2 years and am quite happy with the quality. It’s actually steel (magnetic) with plastic molded around it.